It was a murder on the New Jersey Turnpike – stunning violence near the New Brunswick exit. Now, decades after Black Liberation Army leader Joanne Chesimard was sentenced for the 1973 killing of a state trooper, escaped prison, and surfaced in Cuba in 1984, she is first and foremost among the estimated 70 American fugitives harbored there whose apparent flouting of U.S. law is fuel for critics of recent efforts to restore U.S.-Cuba relations. In December, 54 years after America severed diplomatic relations with Cuba, Presidents Obama and Raul Castro proposed a renewal of ties. “We view any changes in relations with Cuba as an opportunity to bring [Chesimard] back,” said New Jersey State Police Col. Rick Fuentes, “and stand by the reward” for her capture. Havana: A delegation of United States’ Republican senators met with Cuban First Vice President Miguel Diaz-Canel and Foreign Minister Bruno Rodriguez and discussed bilateral relations and other issues. Senators Jeff Flake, Susan Collins and Pat Roberts met with Diaz-Canel at the Palace of the Revolution on Saturday and discussed the “progress made in the modernisation of Cuba`s economic and social model”, current bilateral relations and the “need to end the embargo”, state-run National Information Agency (AIN) reported. 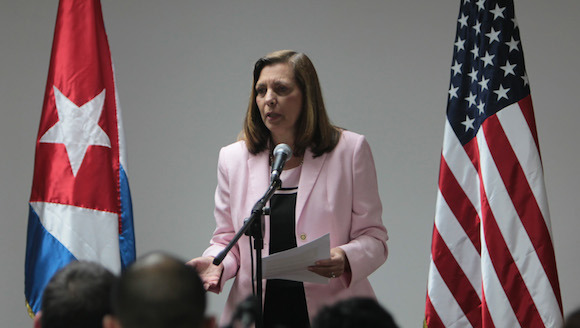 Cuban foreign ministry`s Director General for the US, Josefina Vidal, who heads the Cuban team in negotiations with Washington, attended both meetings. The delegation – which arrived in Cuba on Friday – is the first ever made up entirely of the Republicans since Washington and Havana announced last December 17 the decision to renew diplomatic relations. The new policy of US President Barack Obama toward Cuba has met with strong opposition from some sections of the Republican Party, in whose ranks, however, there are lawmakers like Jeff Flake that support bilateral understanding. Senator Flake of Arizona is the chief promoter of the Freedom to Travel to Cuba Act, introduced in the US Congress last January as a move toward ending legal restrictions on US citizens traveling to the island nation. Flake, a member of the Senate Foreign Relations Committee, first traveled to Cuba last November along with Democrat Tom Udall to visit imprisoned US contractor Alan Gross, who was freed following the announcement of the thaw in US-Cuban relations. Editor’s Note: Directorate of Intelligence (DI) officer Josefina Vidal was thrown out of the United States for espionage in 2003. She is likely to become the first Cuban Ambassador to the US under the Castro regime.